When I came to live in France 12 years ago my daughter gave me a collection of cuttings and seeds from her own garden to plant over here. I can honestly say that most of the perennials and self seeded annuals that populate my garden now came from her. 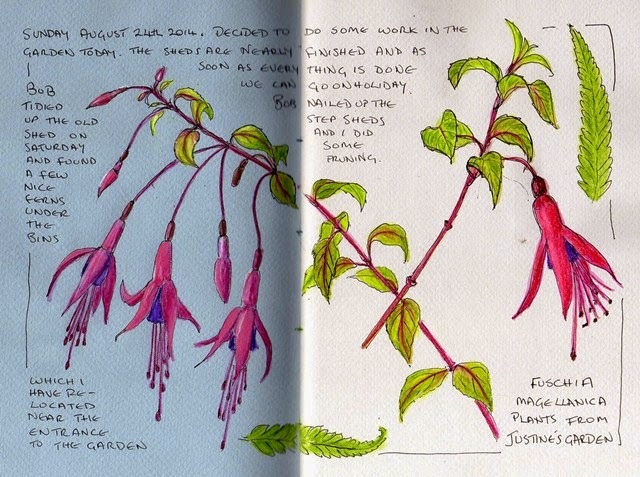 This Fuschia is opposite my dining room window and very popular with the bluetits that feed on the insects that crawl on it, allowed to flourish because I don't do any pest control except for the slugs and snails that eat my dahlias. You really captured the beauty of those fuchsia Valerie. Your fuchsia is beautiful. I have a two plants I brought here from my mother's garden ... a lilac and a low vine I can't name, but I treasure.